It has always been a difficult task for energy consultants, solar power professionals and energy system planners to provide their customers with an effective overview of the future efficiency and precise configurations of planned energy systems while planning the future energy supply of their customers’ enterprises. If the system involves different energy sectors, the entire planning process is time-consuming, expensive and complicated, not least because each energy area has to be calculated in its own application. The process of merging the results to create an easy-to-understand calculation for the overall system has always taken considerable time and effort because there has never been a single system planning program that merges the data from the individual sectors. 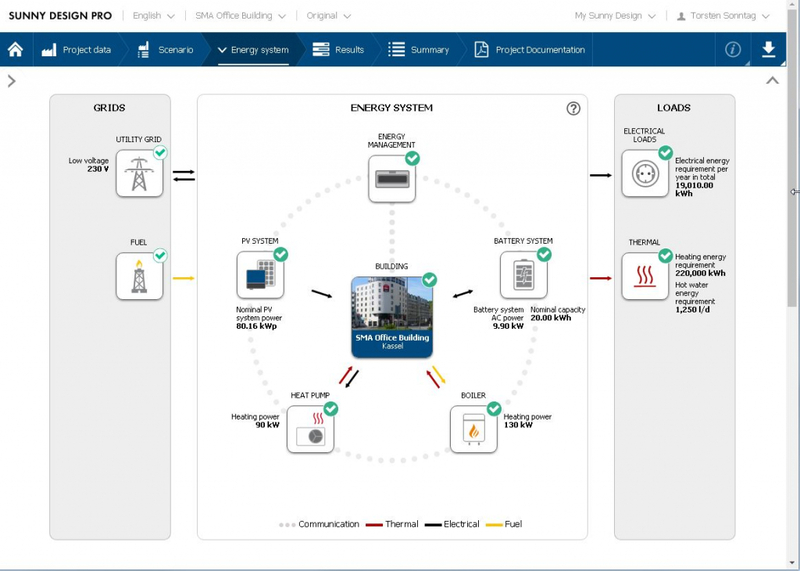 Sunny Design Pro is the first program ever that allows an entire system to be planned and simulated across different energy sectors—and it can even do this using the powerful energy management functions available in ennexOS. To begin with, the system planner receives a customized template for the planned energy system containing all the devices, such as PV systems, heating systems, CHP plants and/or battery storage systems, that have to be included. 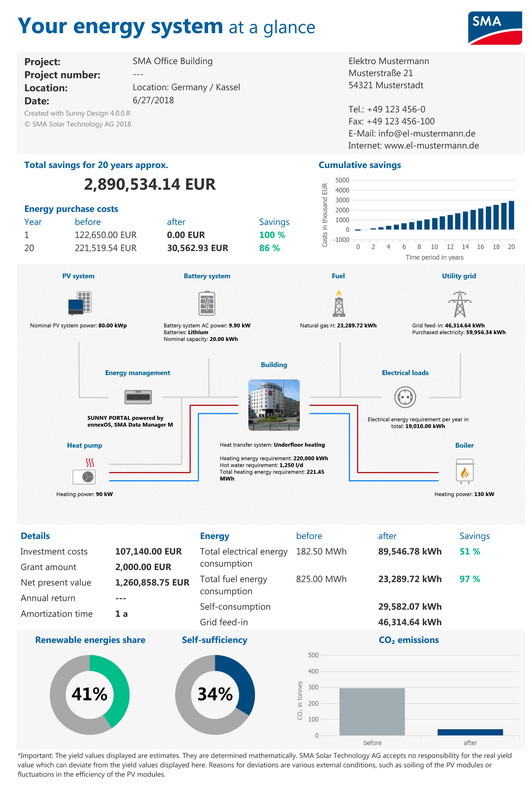 The program then almost instantly generates a scenario showing the expected costs, the forecast energy generation and the expected energy consumption in an easy-to-understand representation of the overall system, allowing the system planner to forecast the efficiency of the planned energy system. If necessary, the system planner can simulate a system expansion and again instantly receive the corresponding forecast. Product Manager at SMA, who has played a leading role in upgrading Sunny Design Web to develop Sunny Design Pro. How do our customers benefit when they upgrade from Sunny Design Web to Sunny Design Pro? With Sunny Design Pro, we have moved one step closer to the digital energy supply of the future and made it even easier for users to configure intelligent energy systems. System planners, solar power professionals and energy consultants can provide their customers with a sound decision-making basis and give valid forecasts of the efficiency of the planned energy systems. What else can Sunny Design Pro do? In addition to planning entire energy systems, Sunny Design Pro helps users plan on-grid, off-grid and PV hybrid systems. Users can save and manage their projects, manage even highly complex purchase and feed-in tariffs and simulate the use of battery storage systems in peak load shaving* applications. System planners have always been able to simulate PV systems and battery systems above all. How does SMA ensure that other forms of energy can also be calculated in a valid way? To provide our customers with optimal results and simulations, we now use Polysun Inside software from Vela Solaris AG in the Sunny Design Pro. This software has long proved its worth as a planning and simulation tool for thermal systems and it will also help us keep expanding our range of products and services. *In the energy industry, peak load shaving describes the smoothing of load peaks in industrial and commercial electrical appliances. These peaks in power consumption are relevant not only to grid stability but also to electricity purchase costs. The grid use charges are based on, among other things, the highest purchased power in the settlement period. The more uniform the electricity purchased, the lower the demand rate costs of the grid use charges. If a future PV system operator decides to actually install the planned system, the planning data can easily be downloaded from Sunny Design Pro for commissioning. This saves time and minimizes costs. Once operating, the energy system can be integrated into SMA’s solar monitoring and energy management system with the SMA Data Manager M. On the basis of the ennexOS energy management platform, the Data Manager M enables optimum communication, monitoring and, very soon, regulation of all energy flows in a company’s energy system. While it has always been possible to perform monitoring and use a whole range of data acquisition and analysis functions, it will also be possible to control the individual energy sectors via ennexOS in the future. What is cross-sector energy management? 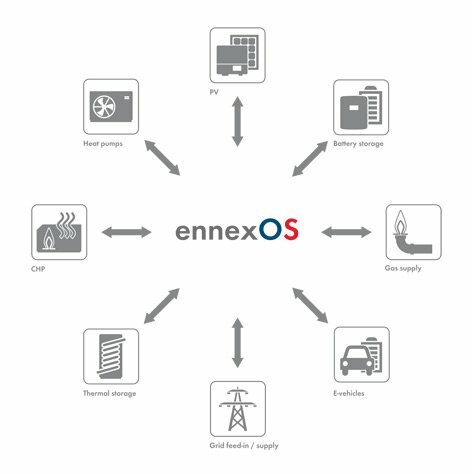 ennexOS from SMA is the only cross-sector platform for comprehensive, intelligent energy management. Energy flows can be sustainably optimized and energy costs significantly reduced via the interconnection of various energy sectors, such as heating, climate control, electricity and mobility. SMA develops forward-looking solutions for all photovoltaics applications that allow its customers to exploit the full potential of their energy systems in an increasingly decentralized and digital energy landscape. The coupling of the individual energy sectors—electricity, heat, mobility and industry—to create a single, complete system plays a key role here. This will help bring about a future in which we can store energy in battery storage systems and increase the flexibility of the electricity system by integrating fluctuating grid feed-in. Among the key factors here are the interfaces with the individual sectors that will allow more renewable energy to be used in homes, factories and mobility solutions. 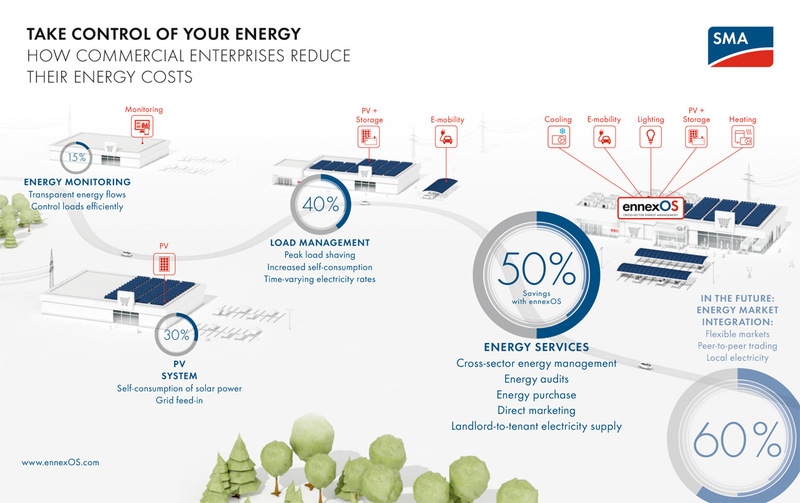 The ability to connect the individual sectors to create a single, overall system allows PV system operators to optimize the energy flows and significantly reduce costs. 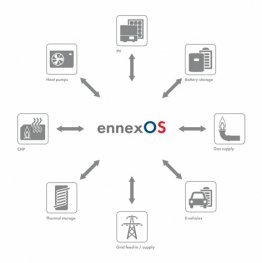 With the ennexOS cross-sector energy management platform, SMA has created a comprehensive, intelligent energy management system designed for commercial applications for the first time. 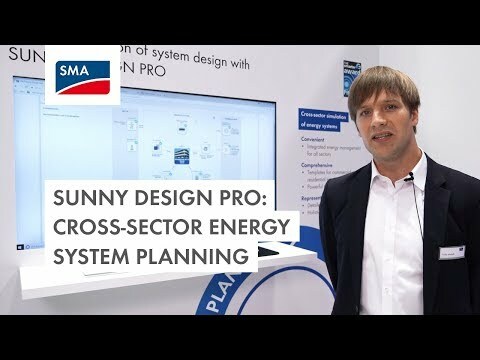 Sunny Design Pro, the SMA Data Manager M and the new Sunny Portal powered by ennexOS provide customers with whole new ways of using energy independently, efficiently and flexibly by ensuring optimum communication, monitoring and, very soon, regulation of all energy flows in commercial solar applications.